Nick Green from 1st Fire Safety, just wanted to publicly endorse you and your company for the excellent job you carried out for my client in Orpington. It was a complex job to say they least 25,000 sf.ft building, split over 4 floors. I was really impressed with your fire action plan & escape route maps they are brilliant and very helpful for the tenants. You offered a one stop shop for everything we needed for our commercial site which we have set up as business centre, your in depth knowledge of regulations is amazing. I will be recommending you to my HMO clients without a doubt. Had a fire assessment done by Nick Green of 1st Fire Safety and am impressed with the rigour of the assessment! Recommended!! Thanks a lot for the certs and the note on the extinguisher issues, I have forwarded it to the responsible persons. 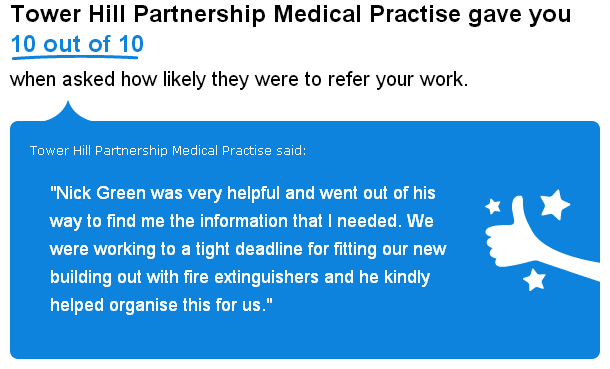 Thank you again for the fire training, I have received really good feedback from my colleagues.